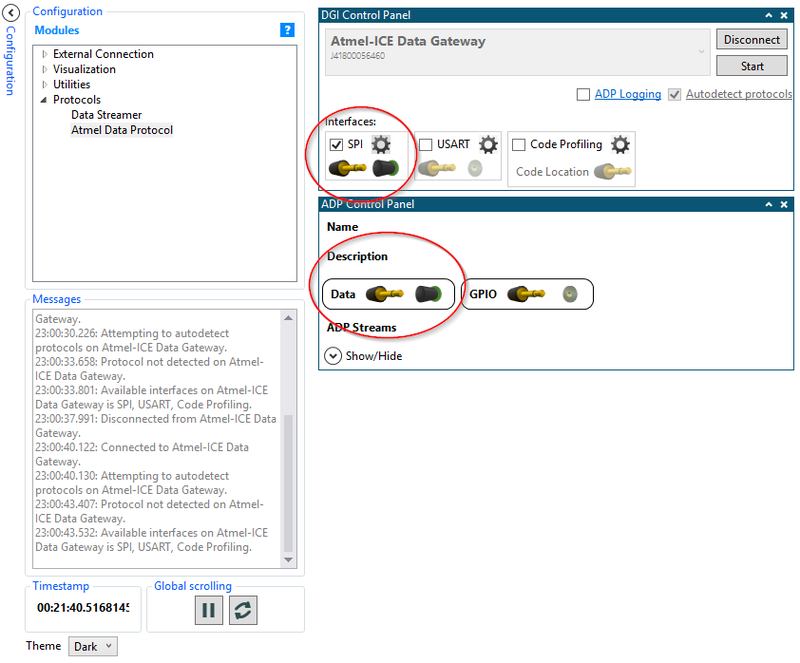 Hi, i have question to the Atmel Data Protocol. 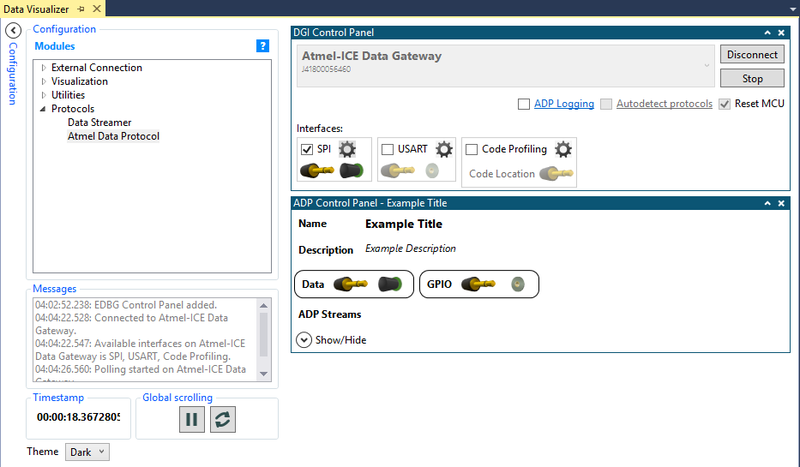 I read the Webdocs of the Atmel Data Visualizer and Atmel Data Protocol. The ADP works so far. I request a handshake, wait for answer and set my dashboard, streams and so on. In Webdoc i have seen this: "So when you plug in a board with firmware that supports ADP and press the Connect button, everything will be configured for you. That is truly plug-and-play!" When i push the connect button and repeatedly send "MSG_REQ_HANDSHAKE", then i get no answer while it is on "Searching for protocols". My question now is: "Did i understood something wrong?" I have no XPlain Board, so i can't use the example code from Atmel. 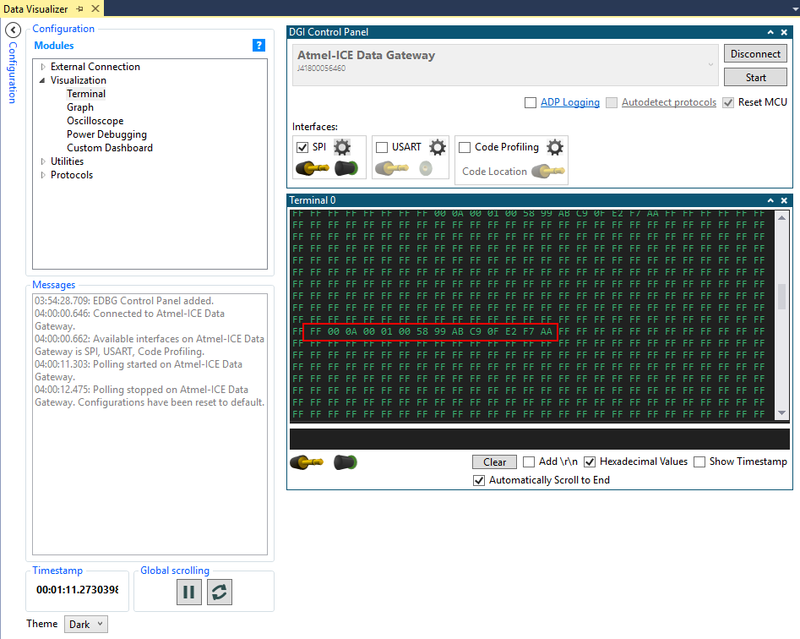 I haven't ported the code of the Atmel example, because it would be to time-consuming. Is there a special Token i have to send while it searches for protocols? Everything works when i insert the ADP Control Panel and connect SPI from the DGI Control Panel. 1. 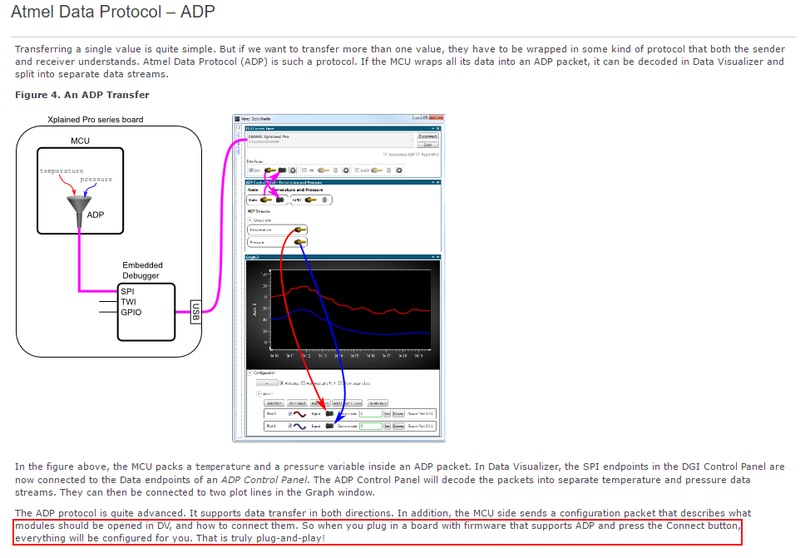 I finaly ported the Code from the "ADP example application - SAM D21 XPlained Pro". When i disable "Autodetect protocols" and use the "SPI Interface" with the Terminal, i get the following data (See picture). Everything should be fine so far. The marked data is the REQ Handshake. 2. 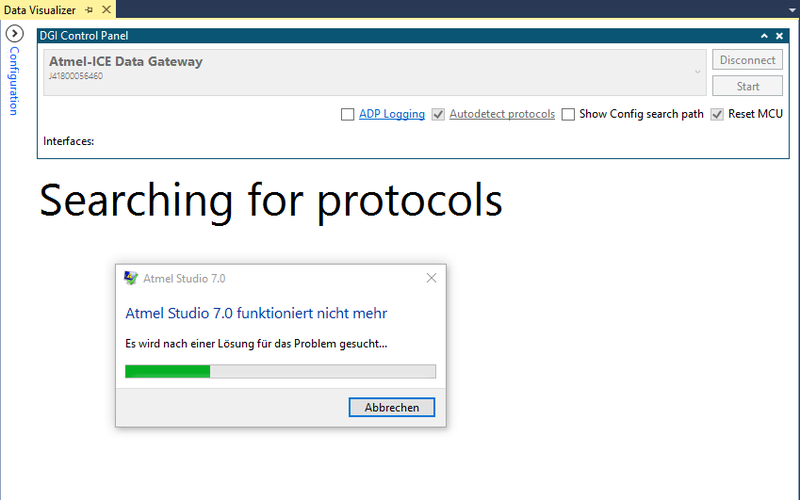 When i press Connect with "Autoprotect protocols" enabled, then Atmel Studio Crashes. Would be grateful for any idea. Problem solved "More or less". With an Atmega328-PU, 16MHz OSC and fosc/128 settings it seems as if the baudrate still is to high. When use an delay of some microseconds in the adp spi interface it works. Or possible it is the SS signal... Ah i don't know. For now it works. UPDATE: If anyone runs into the same issue. I added an 1ms delay into the while loop of the adp check for response method, now it works like a charm. Can your upload source of your port APD to ATMEGA328 ? Or send pm ?